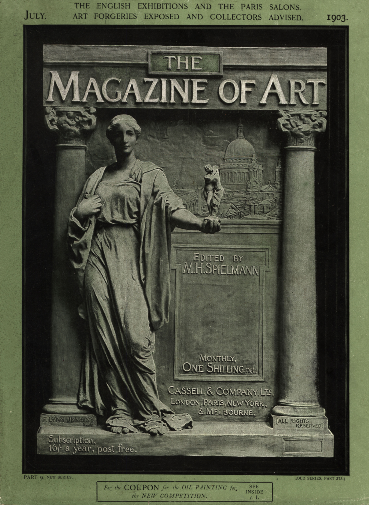 The Magazine of Art was similar in its coverage and format as The Art Journal. Its editors were, in turn, Arthur James Richens Trendell) 1836-1909) from 1878 to 1880; Eric Robertson in 1880-81; William Ernest Henley (1849-1903) from 1881 to 1886; Sidney Galpin in 1886; and Marion Harry Spielmann (1858-1948) from 1886 to 1904.
lively, cosmopolitan review of the arts containing criticism, prose, and poetry of lasting worth”. During the seventeen years of Spielmann’s editorship, many of the leading artists and critics of the day, notably John Ruskin, were commissioned to write articles for the magazine. By 1904 The Magazine of Art, like The Art Journal, found it increasingly difficult to compete with some of the more dynamic new rivals such as The Studio, and consequently ceased publication.